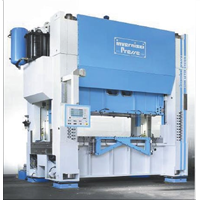 The Italian manufacturer Invernizzi Presse employed Marc and Patran to improve existing presses and to develop new custom-made presses. They also used MSC Software tools to illustrate the functional performance of the presses to their customers. The combination of Marc and Patran was used for various contact analysis, mechanical safety structure analysis, and load calculations. Invernizzi engineers could try more design variants in less time and gained more accurate results than by using traditional mathematical calculation methods. As a result, Invernizzi realized significant time savings, and, while optimizing material usage, saved production costs. Before using MSC Marc, the development department of Invernizzi Presse used mathematical methods to do the calculations for the presses. These methods were time-consuming and less precise because only a certain number of design variations could be tested. The production of a physical prototype would be impossible due to cost and time restraints. Contact analysis between pivot, bearing, and connecting rods to evaluate the flex/bending stresses in the pivot, the contact pressure on the bearing, and the resulting rod stiffness. • Contact analysis between the presses’ pivot, bearing and rod, along with the backlash of the pivot, in order to understand the thermo-mechanical behaviour of the bearing. Invernizzi engineers found that the heat generated by the friction between the parts increased the temperature of the mechanical components, breaking the oil film and seizing the mechanism. With this knowledge, the design was modified to improve performance. • Mechanical safety structure analysis. The MSC.Marc model allows engineers to study the mechanical behaviour of the safety system used on all types of presses. The analysis uses flexible contact elements and an external force representing the oil pressure. Epicycloidal analysis (study of a multi-stage gear transmission system). This simulation allows Invernizzi engineers to evaluate the stresses in complex gear systems in order to optimise the gear dimensions, avoid gear failure during duty cycles, and extend the life of the mechanism. Load calculation during the bending process in order to understand the correct force needed to obtain the correct bending of the material. Using the results of these simulations, Invernizzi can demonstrate the functional performance of a press without having to build a physical prototype, illustrating to its customers that the press will fulfill the requested tasks.